We headed out one chilly, wet Sunday morning to Grovelands Park. 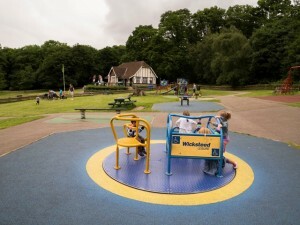 While visiting the London area we always seek out parks. I think parks (other than tea) are one of the things that the British do best! 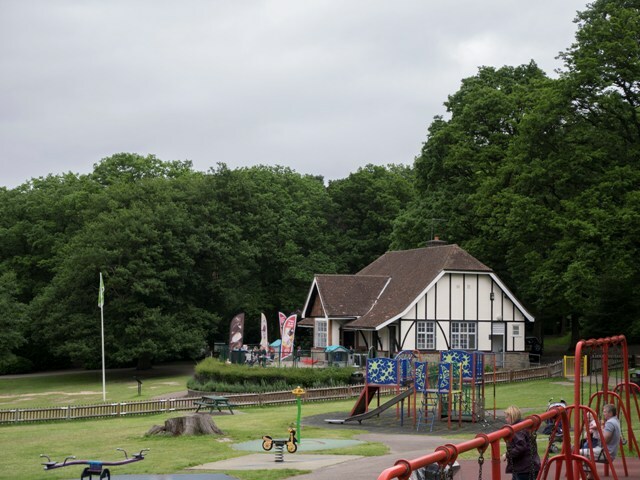 Grovelands has the required cute cafe, with snacks, cold drinks and of course good coffee and tea! The patio overlooks the kids playground and the lake. It is a lovely place to enjoy a few quiet moments. The patio also has a few plastic houses for the toddlers to play with while their parents catch their breath! This park has two playgrounds, the one near the cafe is for younger kids and has all the standards plus it is wheelchair accessible. The second playground is a natural climbing area for bigger kids. 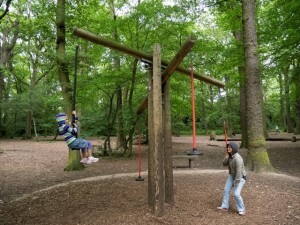 I love this area, it is in the wooded area of the park and is a perfect place to practice those climbing skills. We walked through the wooded area and climbed trees, crossed a dry creek bed, and enjoyed nature to the hilt! This park has a lovely wide path that parents and kids were busy running, biking and walking around the large lake. There is huge field that seemed to be the best destination for dogs to run, kids to play ball and even picnics. Don’t forget the outdoor workout station for the parents to use! Oh, I almost forgot there were kids fishing in the pond too! We could easily spend an entire day here playing and picnicking and biking! Click Here for the location and directions to Woodlands Grove Park. 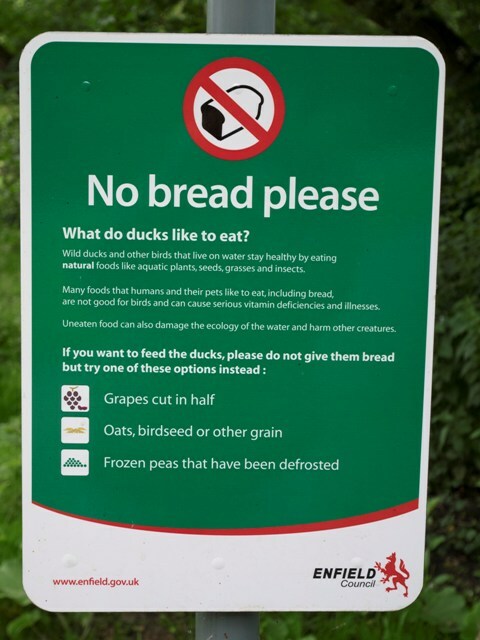 Loved this sign, asking that you not feed birds bread, but cut up grapes and frozen peas instead. If you have found this site helpful and want to keep us writing please use the Donate Button on the right side of this page. 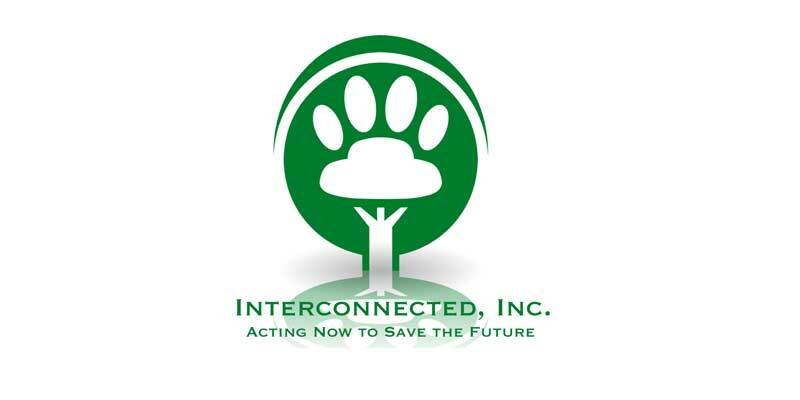 This helps us pay for our domain, ip address and hosting. Some sites require membership fees in order to pay for their site. We really want this information to be free and available to all. This entry was posted in Best Playground, Events and Reviews, London and tagged biking, bush hill park, enfield, football field, London, picnics, Playground, winchmore hill, woodlands grove by Cynthia Buckley. Bookmark the permalink.